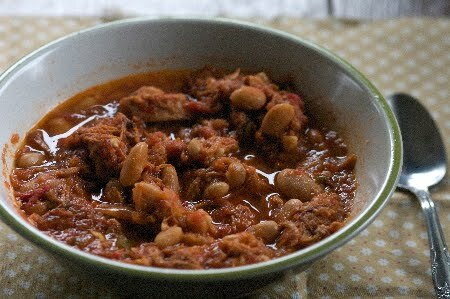 cardigans and kids: a recipe for chicken chili. a recipe for chicken chili. I have wanted to try a chicken chili for several years, now I don't know why it took so long. Even roasting the veg first goes quick. My new favorite chili. It has a nice kick to it, but not so spicy that it overwhelms the other flavors. 1. Roast the veg. Preheat the broiler, and I just placed the drained tomatoes (side by side), pepper, onions and garlic on a jelly roll pan in the oven for 5-7 minutes. Save the tomato juice to go in the chili later. 2. After I removed the veg from the oven, I ran it quickly through my food processor. 3. Add a teaspoon of olive oil to a large heavy bottomed pot, then add the chicken, only add the olive oil if your chicken is really lean. I had left some broth from cooking the whole chicken and so mine had enough oil in the meat that I did not add any before putting the chicken in the pot. 4. Add the already food-processed veg, remaining tomato juice from the can, chili powder and salt and heat on med. high for about 5 minutes, stirring often. Add the chicken bouillon cubes, water and the beans and simmer for 20-30 minutes. Serve with sour cream and cheddar cheese. Warning: the poblano is warm, so I added the sour cream to my kids bowls with out even asking them, just to help with the heat from the pepper. *instead of the whole chicken, 3 cooked/shredded chicken breasts and/or 4 thighs would work. If you have not cooked the chicken in advance and are using the chicken breasts or thighs, don't worry about it, just cook in in your pot with some olive oil before adding the veg. -the northern beans could be replaced with kidney beans. I've also traded out the poblano pepper for 2 1/2 jalapeno peppers.